The casino conglomerate expects to double its use of renewable energy and earn payback within 7 years. Nevada’s largest employer is finally prepared to stop purchasing electricity from the state's biggest utility on October 1. MGM Resorts International, which owns much of the Las Vegas strip, grabbed headlines in May after ending its energy-buying relationship with Nevada Power, a subsidiary of NV Energy. It was of the largest defections from an American utility by a commercial customer, and could set the model for more large companies in states where they're allowed to go out on their own. MGM is now contracting with independent energy company Tenaska to serve as procurement adviser and scheduler for the 171 megawatts consumed by its Nevada properties. The motivations for the departure were energy independence and the desire for more renewable energy, said Cindy Ortega, senior vice president and chief sustainability officer at MGM, in an interview with GTM. Speaking at the top of the golden Delano hotel tower, with the Mandalay Bay’s 8.3-megawatt rooftop solar PV array soaking up the Nevada sun in the background, Ortega explained that any company leaving the service of the utility is required by law to match the state renewable energy standard of 23 percent. "We’re required to do 23 percent; we’re going to try to double that," Ortega said. "It’s going to increase, no question about it." The company, though, won’t be investing its own equity in new solar generation -- at least not yet. The economics of solar are still changing enough that MGM’s leadership doesn’t want to lock down capital in a 20-year contract when they could just procure clean energy from Tenaska. Meanwhile, Ortega has led an effort to cut down MGM’s load so it doesn’t need to buy as much electricity. Its Las Vegas properties have seen electricity demand drop 11 percent in the last five years as a result of energy-efficiency investments. Three more retrofits are in the works, including an installation of 1,300,000 highly efficient LED lights. The long-term savings and self-control come with a significant upfront expense: MGM has to pay about $87 million to leave the service of Nevada Power. This amounts to slightly more than MGM pays for electricity in a year. That charge is not a penalty for exiting, per se; Ortega called it an “impact fee” that compensates the utility for investments made in order to serve MGM. The fee is so large because MGM was the biggest customer, accounting for 4.86 percent of Nevada Power’s sales, according to the Las Vegas Review-Journal. As it turns out, MGM had considered leaving the utility back in the early 2000s, when Las Vegas was growing faster than most cities in the country. At that point, the impact fee would have been negative -- leaving would have meant the utility didn't need to build out new generation for the growing consumer population. When it comes to figuring out an exit, "The fight really is around load growth: How soon does load get replaced?" Ortega said. Times have changed, and the $87 million is just the beginning. Nevada Power will continue evaluating the costs to the system from MGM’s departure, and Ortega said she expects to pay another $80 million in the next six years as that analysis concludes. That said, Ortega said MGM should receive payback on the exit costs within six or seven years. From day one, it will benefit from exercising more control over its power sources and how much they cost, which is harder to quantify. In this transition, MGM won’t be pursuing new solar installations for solar’s sake alone. “I’m a conservative,” Ortega said at one point. The numbers have to speak for themselves. 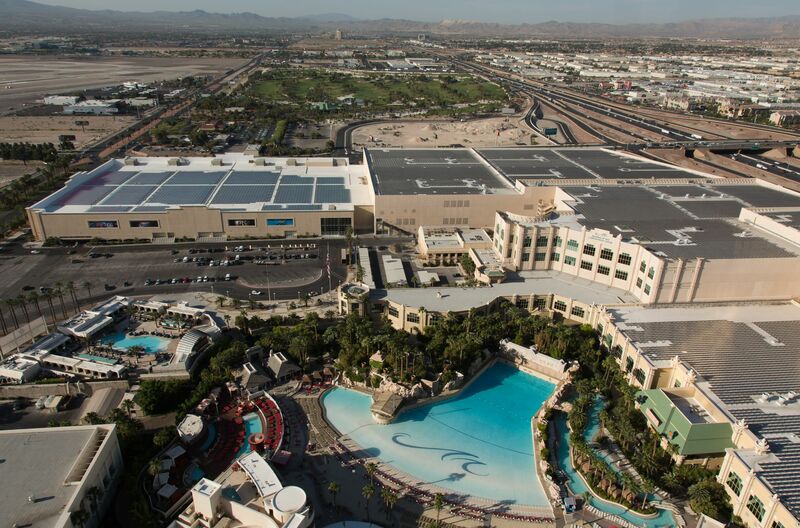 The Mandalay Bay rooftop project, for instance, worked for the company because it happened jointly with a roof replacement; the solar array extends the new roof life five years. MGM also found a mining company that wanted to purchase the associated RECs. In keeping with MGM’s light equity footprint, it signed a power-purchase agreement with NRG, which owns and operates the rooftop panels. Policy barriers hinder the profitability of onsite arrays as well. 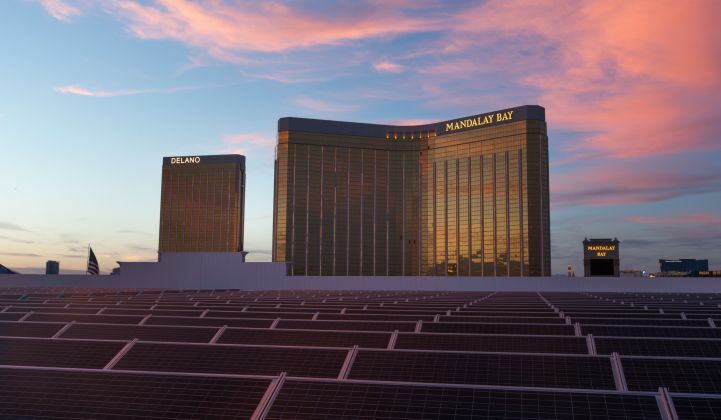 The Mandalay Bay project exceeds the state cap on the size of distributed generation sites that are allowed to export to the grid, so all electricity produced must be consumed onsite. That’s not a problem for the energy-intense casino and entertainment hotspot -- the solar only meets about 25 percent of the campus’ load, so no excess must be dealt with. The law does, however, prevent the rooftop generation from earning revenue through net energy metering in ways that might be more beneficial to the company than pure self-consumption. "The local Nevada policy needs to change to open markets so that industrials can sell back," Ortega said. "As you can see in any major metropolitan area, that’s really good for the people in the community, because when I can produce energy and sell it back as opposed to them buying it at the peak price, it’s better." MGM’s exit stands as a proof that it can be done. A fellow Vegas casino company, Wynn Resorts, will be taking the same path this October, albeit with a much smaller footprint. For its part, Nevada Energy is trying to support its customers. That ability is, in fact, a right created by legislation passed in 2001 during a time of limited energy supplies that was intended to ease strain on the grid by letting big consumers source power themselves. It's still on the books, even though supplies aren't so tight these days. Still, any company looking to go this route must operate in a state with an equivalent law. MGM is the largest employer and largest taxpayer in the state. If any corporation could use its power to get over the institutional hurdles, it should be this one. But even with that clout and up to 100 people working on the effort, it took five years to become reality.